** PLEASE TAKE A WALK THROUGH YOUR NEW HOME WITH THE 3D INTERACTIVE VIRTUAL TOUR ** Beautiful and well maintained 3 bedroom, 2 bathroom home centrally located to all North Port amenities! Pull up and be greeted with an entrance that’s sure to please – put out a small bistro table & chairs and enjoy your morning cup of coffee & the beautiful Florida weather! Open the front door to your great room with tile floors, vaulted ceiling and large window allowing in all of that natural Florida sunlight. The dining area is large & spacious with sliding glass doors that lead out to your over sized fenced in backyard, a great spot for entertaining family & friends! The kitchen boasts an eat-in-area, large center island, laminate counter tops, double sink, closet pantry, plant shelves & an abundance of counter and cabinet space. All SS appliances are included in the sale! Bedrooms #2 and #3 along with the updated guest bathroom are across the home in the desirable split bedroom floor plan. Each bedroom has gorgeous laminate wood floors, private closets, ceiling fan & window. The master suite is a great place to relax! This space features laminate wood floors, walk in closet, granite counter-top vanity, tiled shower and toilet w/bidet. 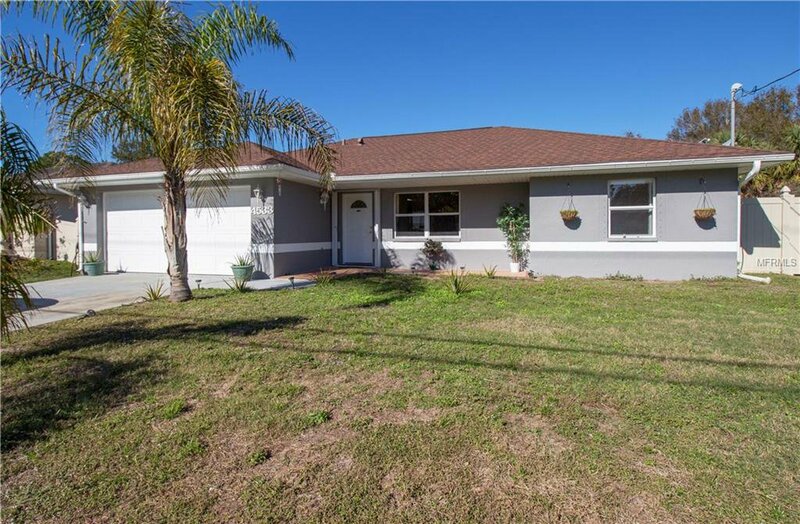 Convenient Location in North Port with easy access to both I-75 & US 41 which are both just minutes away. Great for the commuter. Family friendly city with much to offer. This home is priced to sell and will not last. NEW ROOF in 2014! Please schedule your private showing today! Listing courtesy of RE/MAX ANCHOR REALTY. Selling Office: FINE PROPERTIES.